Like the anticipation of the arrival of spring, the Word has moving, stirring and growing deeper within me in a few areas as of late, but especially His desire for unity. God is blessed when we live in community. Even that very word includes both the requirements for healthy community: “come” into “unity.” When we unite, God releases a blessing upon us as we come together to seek Him in community, for He draws near. As a community, we honor God when we pull together as one. For the One who died for us all is our unifying factor, the commonality which is the basis for our community as a body of believers. When we all use our gifts for His glory, not our own, our unity becomes apparent to those around us. The community at large takes notice when His people live and work together in unity. When peace abounds instead of division and turmoil. Where we willingly submit to one another out of love, placing the needs of the body above our own. When we confess to one another our offences and flaws, and find forgiveness, true rest for our souls. This world is screaming out self-satisfaction, for life to be all about ‘me.’ When we gather in unity to worship God, following His way and not our own, His peace can be sensed in our communities. Not only in each of us as individuals, but in our collective focus on Him. As our prayers arise to Him, asking for Him to make us one, He releases a fresh wind of His presence, and community. 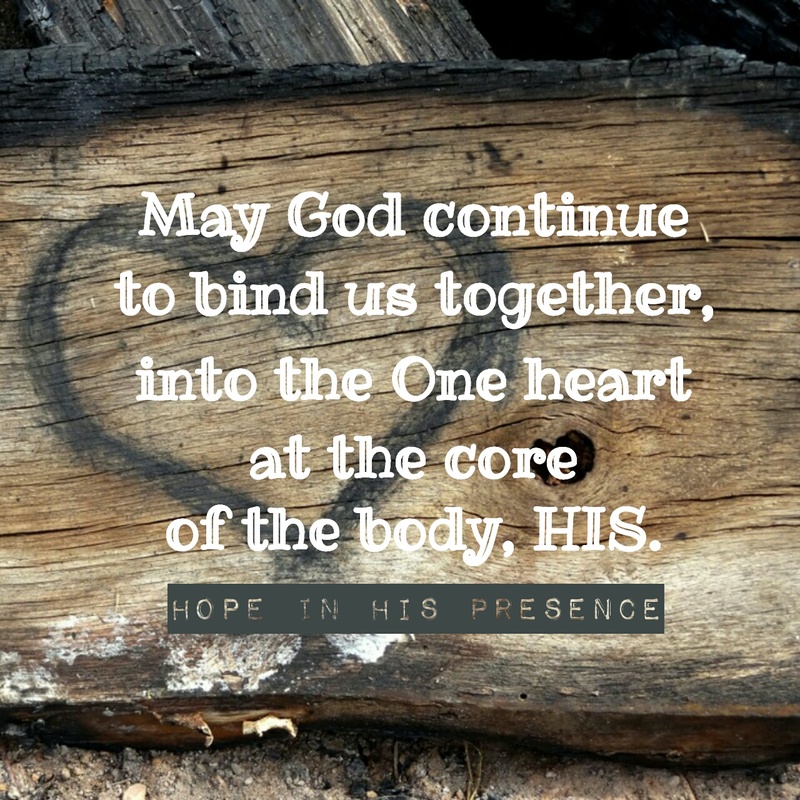 May God continue to bind us together, into the One heart at the core of the body, His. Next Sunday Psalm: Be Still, Seriously? love this – that we can be in community and live in love, even when we don’t agree. We need to agree to disagree sometimes and move forward with love and compassion. Set aside our differences so we can focus on our mission of serving God. Amen Kathryn 🙂 Thanks for sharing His heart with me!